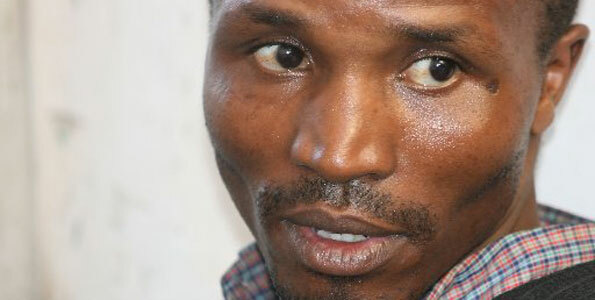 Mr Onyancha’s high cheekbones and deep set eyes give his face the triangular look of a fox. There is something in the emotions that play on his face as he goes through the business at hand that chills the blood, a confused blend of shyness, cunning, fear and a sly menace. At the back of Mr Onyancha’s head is a tumour the size of an orange. When he was alone, the Nation saw Mr Onyancha raise his face, his mouth agape and mumble to himself. The former G4S watchman is a moral and legal hazard. He has claimed to the police that he is responsible for 17 murders and he has been conducting officers around the country, showing hidden bodies. By Wednesday, his confession is all the police had. But a confession to the police or the media has no standing in law, only a confession to a magistrate counts as evidence. On Kwame Nkrumah Street in Thika at Suitable Lodging, Mr Onyancha showed officers to a cramped, dirty room where he claimed to have committed the second of two murders in the town. In Nyeri, the last stop in his busy day, Mr Onyancha took a few questions from the Daily Nation. “My target was to kill 100 women. I managed 17 and there were 83 to go,” he said. The whole business of killing started when he was recruited into a cult by one of his teachers in 1996. Police are looking for her. He was given the target by the woman, he claimed, whose name he can now not recall. “In the cult, it was like in a stage. And to go to the next level, I had to kill a lot of people and also meet the leader of the cult,” he added. In 2007, Mr Onyancha said, he travelled from Nairobi to Nyeri after, he claimed, the spirits directed him to go and kill. He claimed the same spirits gave him special powers to subdue his victims. He did admit that he only killed women, because they are more vulnerable. “When the urge comes, they are the easiest victims,” he said. “When I meet my target, even if she tries to resist she can’t. I only need to greet her, shake her hand and she becomes confused, kind of. “One time in Nairobi, I managed to make a lady follow me only by talking to her, but because I did not greet her, she survived,” he said. He strangled all his victims, he claimed, and did not sexually abuse them. In an emotionless explanation of why he claimed to senselessly take lives, Mr Onyacha said he felt a “powerful and unstoppable” urge to kill and derived pleasure and satisfaction from strangling his victims and drinking their blood. The urge became more and more powerful as time went on, he said. Catherine Chelengat, whose pile of bones were found in Karen, went missing on November 2, 2008, according to relatives. At the time of her disappearance, Mr Onyancha was a G4S guard and stationed at the Water company’s office in Karen. Catherine finished college at Kabete Technical Institute in Nairobi earlier in 2008, and had a nine-year-old daughter. “We heard nothing from her captors for the next three months. They called us on phone and demanded Sh30,000. We pleaded for time as we did not have the money. We reported to police at Karen,” said Mr Wesley Rotich, a relative. The family raised Sh15,000 and sent it to the kidnappers using M-Pesa, just as they had demanded. Mr Rotich was the last relative to see her alive. “It was on a Sunday. She left my house around 9pm, saying she was going to spend the night at her brother’s house. She stayed at my place,” he said. Mr Rotich’s house is less than 50 metres from the Water company’s Karen office. On Riverside Drive, Mr Onyancha said he had thrown a woman’s body into a 10-metre sewage tank. “She was just walking along the road. I just shook her hand and she followed me,” he said. In Thika, at Rwambogo Lodging Room 20 and Suitable Hotel Room 5, he claimed to have strangled two prostitutes. At Kenyatta High School, Mahiga, which he joined in 1995, Mr Onyancha was remembered vividly as a bright and promising student. “He was an eloquent, bright young student who spoke with a lot of authority and excelled in his studies,” said Ms Mercy Thirimo who taught him English. Records at the school in Othaya show Mr Onyancha, who was born in 1978, was admitted to Form One on February 7, 1995. He was among 120 boys who joined the African Independent Pentecostal Church of East Africa (AIPCA) sponsored school that year. His admission No. was 4567. Kenyatta High School, Mahiga, stands on a picturesque hill. You go down a crest on an earth road and up the hill. At the end of the road stands the imposing school opened on June 30, 1969 by State Minister for Foreign Affairs Mbiyu Koinange. Besides a cement artwork of a father nudging his child to a book, the school motto: “Dream your tomorrow. Leave your Today. Live your dream. Meet men of Substance.” It was here that Philip had been brought to school by his father, Mr Samuel Onyancha, in February 1995. Mr Onyancha indicated in the school records that he was a farmer and gave his address as C/O Nyamagena Mabariri Primary School of P.O. Box 49 Etago, Kisii. His mother is named as Esther Moragwa Onyancha of the same address and her occupation is given as businesswoman. He scored 498 marks out of a possible 700 at KCPE which he had sat at Changoi Primary School in Kericho. “A well behaved boy whose ability is above average,” the headmaster of Changoi Primary had indicated in the Kenyatta High School admission form that required to be filled by his primary school. “When he arrived here, he was a very dedicated student who led his class for several terms. But when he got to Form Two, he appears to have lost his marbles after he was suspended for bullying Form One students,” said Mr Onesmus Mwangi the school deputy head teacher who was a mathematics teacher at the time. School authorities said the school board of governors readmitted him after a two-week suspension because accusations against him could not be proved. “He returned to the school but he had lost his lustre,” remembers Ms Thirimo. “This formerly energetic boy who participated actively in ball games and athletics was never the same again. We watched him spiral into a pale shadow of himself,” said Biology teacher Joseph Mwaura who doubled up as the games master. Teachers admitted that at the time he was their student, the school had experienced problems linked to devil worship. By the time he sat his KCSE in 1998, he was no longer the bright boy he once was and scored a grade C-. He never collected his certificate. “All we can say for now is that Philip is not a very good example of Kenyatta Mahiga High School,” headmaster Edward Keritai said. G4S sacked Mr Onyancha this March for absconding work on several occasions. Communication manager Dan Okoth said the man did not display any strange behaviour during the time he worked at G4S. wooow this is shocking news!